My First Product Focus Review! 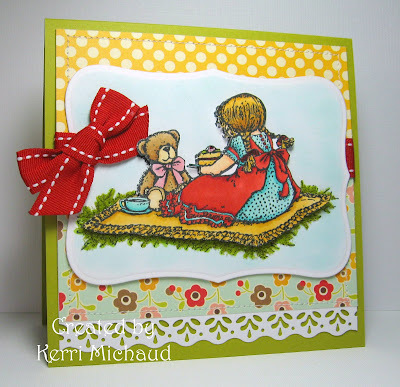 This is a stamp from the Flower Soft Moments in Time series called Best Friends. Love it!!! I used some Sage FSUF on the grass and I just love the texture it adds! The dp is October Afternoon Farm Fresh. For this card I used this adorable Whiff of Joy image Willow with Flower Basket. I added some Strawberry FSUF to the flowers in her basket, in her hair, and to the heart. So fun! DP is PTI's Simple Valentine. My final project uses this super cute set from The Greeting Farm called Oh Baby. I added some FSUF to the baby's bonnet and the teddy's belly : ) DP is Basic Grey Lemonade. If you have any questions about these cards just let me know! I don't have time to fill out the complete recipes right away. Thank you so much for stopping by and check back tomorrow to see some new templates from Perfect Presentation! Oh WOW Kerri these are wonderful, great use of the new fine flower soft!!! AWESOME card sweetie! WOW, such Beautiful cards!!! Love them all, you are so talented. Congratulations, Kerri! LOVE each card!!! These are fabulous Kerri. I love the 2nd one down. So perfect and feminine and pretty. That heart going off the edge of the image is awesome. Love it! Fabulous cards Kerri....you have showcased the product so very well!!! Wow Kerri, these are so gorgeous, you've sure used the product well! Oooo look at all that coloring you did! Fantastic! Your lil' Valentine girl is adorable and I love that shadow effect you do when you color too. Colorful and fun cards! Well how cool is that Kerri?! Awesome that they asked you...yet I'm not surprised, your creations are always fantastic! All of them here are just too sweet...awesome job with that Flower Soft (need to get some)! Congratulations on your new adventure, Kerri! I am very happy for you! I love flower soft products! And you did a fabulous job with it! Really like the grass on the first one! Looks just like real! 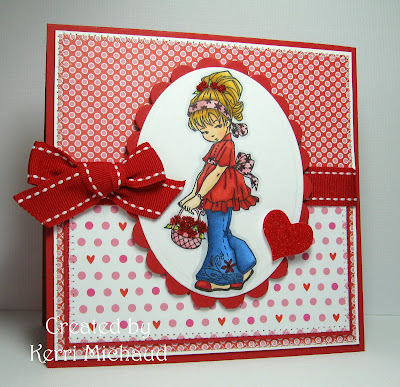 Heart and flowers are so sweet on the Valentine card! 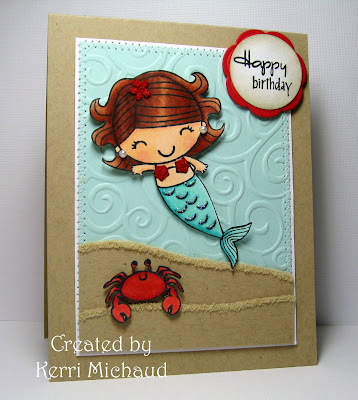 Very neat idea with the sand on your adorable Mermaid card! And look at the baby bonnet! How precious! A BIG congats to you on being on the product focus team! I hope you get to review lots of cool stuff!